celebrating indie artists: Summer Photo Canvas Print Giveaway! Summer Photo Canvas Print Giveaway! So, I take a lot of photographs. A whole lot. I'm not that hot at it. You won't see my stuff up for sale anytime in the near...ever. But I take tons of family photos, and it makes me happy. It makes the family happy too. 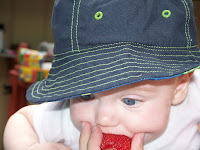 Check this one out of my nephew enjoying his first strawberry. Cute, no? I'm thinking of having this one done up as a photo canvas print for my sister from Online Poster Printing, but I haven't totally made up my mind. We take literally thousands of photos of this kid, and any one would be darling blown up on canvas. Online Poster Printing also does vinyl banners, wall stickers, and rolled or mounted poster prints. Pretty handy. They are offering a free 16x20" Gallery or Museum Wrapped Canvas Print for one of my readers! All you have to do is leave a comment here describing a summer-themed photo you'd like to have printed on canvas, whether it be a family photo, artistic composition, what have you. Don't forget to include a way to reach you! The giveaway is open to US and Canadian residents only. They ask that you pay shipping, but the canvas and printing are totally free. The giveaway is open through the end of July. Other than that, the standard rules apply. So, what would you have printed?